I’m so happy to introduce another guest blogger under the pseudonym of, “And I Read”. I hope that they become a longer term contributor, because I had such fun both lending this book, but also reading the review! Enjoy! Ever wondered what Game of Thrones would look like if all of the intrigue, back stabbing, and treachery is compressed into one city? That is more or less the impression Sam Hawke left me with after finishing the book. Together with the main characters – two siblings, a brother and sister duo – you keep guessing till the end who you can trust and who is trying to de-throne the chancellor’s heir. The characters are overall likeable and you get an in depth glimpse into the personal struggles of the siblings. Each one deals with their situation a little bit differently and tries to help in their unique ways. While I enjoyed the book, I didn’t feel overly connected to the characters. Maybe most other books would put us in the shoes of the stealthy assassin or the underdog hero who tries to overthrow the corrupt ruling nobility. It’s refreshing to experience the story unfold through the eyes of the other side. 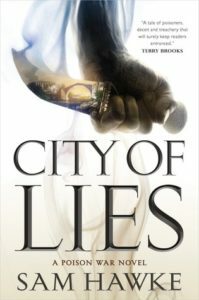 City of Lies is an interesting and engaging read which you’ll hardly be able to put down once you started reading it. Hopefully we’ll learn more about the “ancient spirits of the land” in one of the sequels since, frankly, they were mostly non-existent for the main part of the first book. What do you think of all the fantasy series? Do you prefer stand alones?